52 Comments	This post may contain affiliate links. 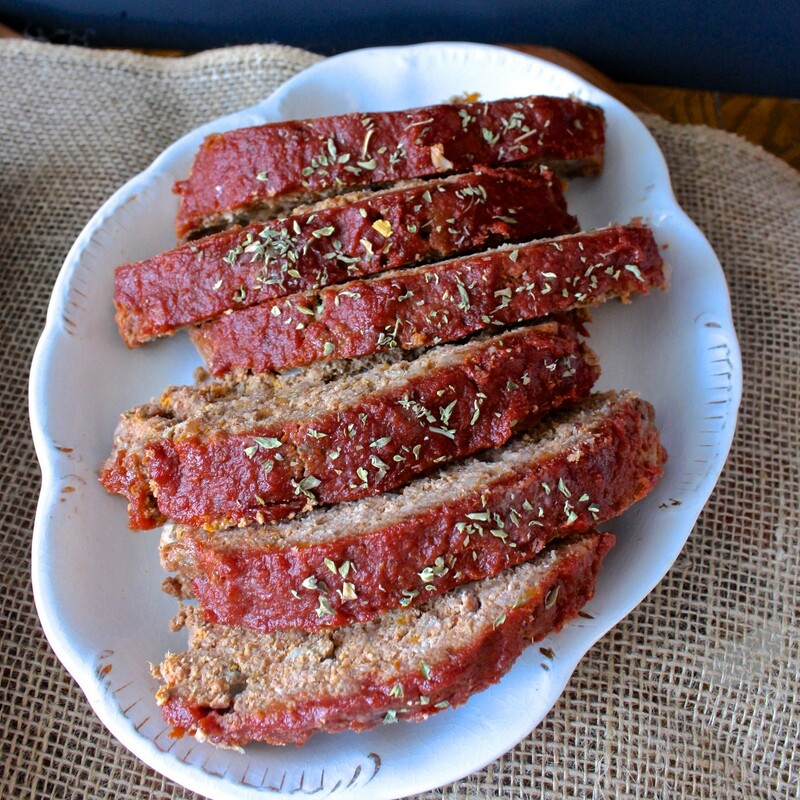 This Paleo Meatloaf has so much flavor and is super simple to make. Classic comfort food made healthier. Gluten free, dairy free, and Whole30. 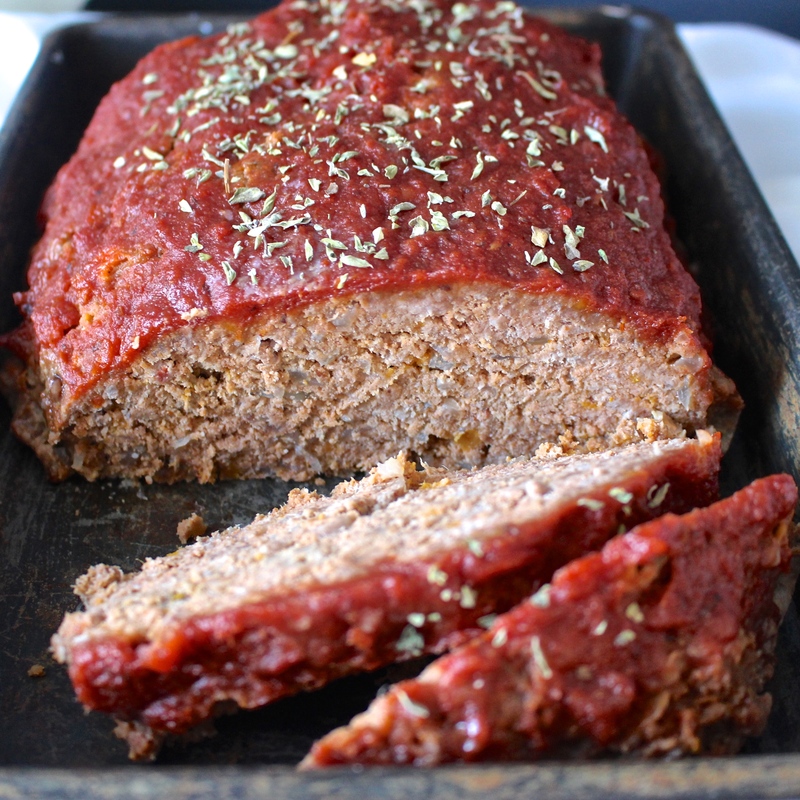 I am a total meatloaf lover! I’m not sure why it gets such a bad rep. Maybe people are making it super bland and dry- that’s my guess. Well, that’s not what you’ll get with this meatloaf. It is moist, flavorful, and even has a hidden veggies! You won’t miss the bread crumbs or artificially ingredients. Here’s the ingredients you’ll need. If you couldn’t tell by now, I love those coconut aminos. I used to use Worcestershire sauce in meatloaf and that takes the place of it now. Since it’s a pretty big loaf, it takes about an hour and a half to fully cook. I’m thinking you could make mini loafs or muffins with it to cut down on cooking time. I highly recommend a meat thermometer to temp it towards the end. You want it between 160°-165°. It will continue to cook a little after you take it out. Here’s the one I have. I’ve had it for 4 years and use it all the time. Speaking of meat thermometers- my husband was pretty sick a few weeks ago and stayed home from work. I called him on my way home to see how he was feeling and he told me he was concerned he had a fever, but he wasn’t sure because the meat thermometer didn’t give an accurate reading. Yes, you read that right. He tried taking his temperature with a meat thermometer!! I had a pretty good laugh. Needless to say, I stopped at Target on the way home to pick him up a real, human thermometer. 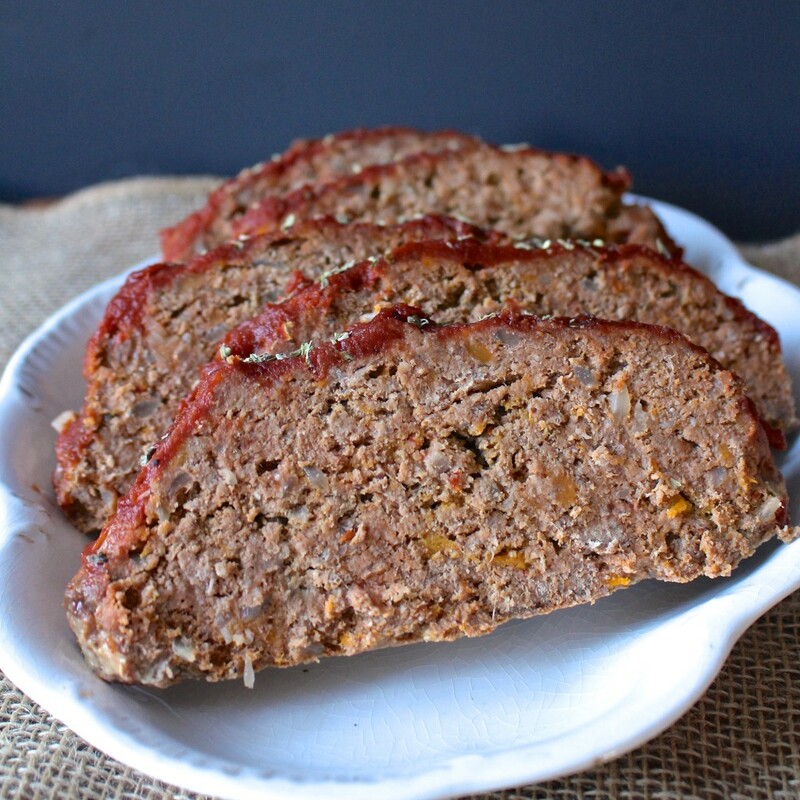 This Paleo Meatloaf is the perfectly savory with a touch of sweetness. I caramelize the onions, which is an optional step, but adds great depth of flavor. You will love it because it’s tasty, healthy, and easy. Great served over cauliflower rice or mash. Here’s the link for my Whole30 Ketchup that I use. Preheat the oven to 350° and line a cookie sheet or roasting pan with a piece of parchment paper. This is an optional step: Place diced onion and a little coconut oil in a pan and sauté until softened and translucent. About 5-7min. 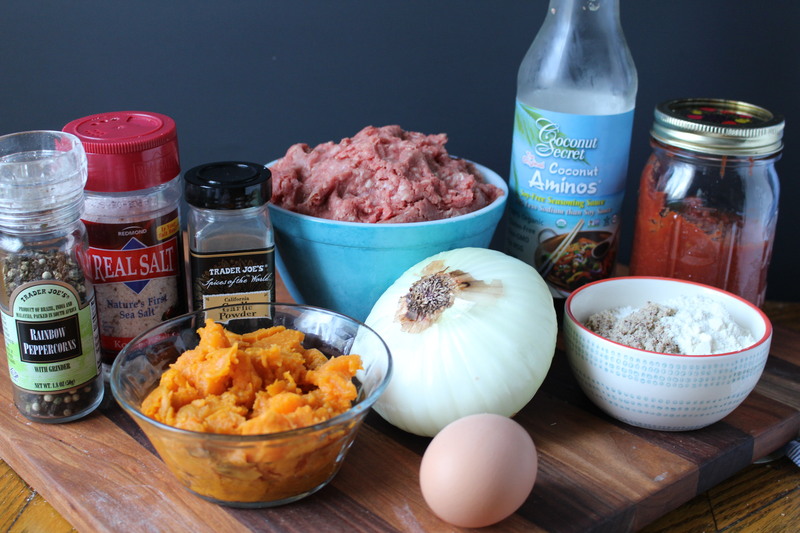 In a large bowl, mix beef, onion, sweet potato, almond flour, coconut flour, egg, ketchup, coconut aminos, salt, and garlic powder together. I find the best way to do this is with my hands. Mix until just combined- don't overtax or it can become tough. Form into a loaf shape and place in pan. Mix glaze ingredients in a small bowl and scoop on top of meatloaf. Bake for 60 minutes and remove from oven. Carefully scoop out all grease into a jar or bowl. Place back in oven for 30 min or until a thermometer reads 160°-165°. Two words for this inclusion of Sweet Pot in the meatloaf: Brill Iant!! I also layered some (cooked) sweet pot in the loaf pan before adding the turkey mixture, and some atop. Ground turkey really needs some oomph, and this did it. I also sautéed abt 6 cloves minced garlic and included.